One of the key requirements of future optical communications technologies is a nanoscale light source capable of emitting ultrafast light pulses. In a new study, researchers have shown that graphene may be an ideal candidate for such a light source, by demonstrating graphene-based devices that emit light pulses with a bandwidth of up to 10 GHz and pulse durations of less than 100 picoseconds (or 10 billion pulses per second). The researchers, including lead author Young Duck Kim at Kyung Hee University in South Korea, Professor James Hone at Columbia University, and their coauthors, have published a paper on the graphene-based light emitters in a recent issue of Nano Letters. "Graphene is an important emerging material in nanophotonics: recent work has demonstrated graphene-based high-speed photodetectors and optical modulators," Kim told Phys.org. "This work adds light emission to the toolbox of ultrafast graphene-based photonic devices." As the physicists explain, graphene has several properties that make it a promising candidate as an ultrafast light emitter, including a high thermal stability and low heat capacity. Previous research has demonstrated graphene-based devices can emit light in the infrared and visible ranges, although the challenge to enable practical fast on-off modulation still remains. The researchers explain that, in order to do this, a substrate-supported device design with efficient heat conduction is needed to enable rapid cooling between pulses. To address this need, in the new paper the researchers encapsulated graphene in hexagonal boron nitride (hBN). They demonstrated that the encapsulation allows the graphene to reach temperatures that are high enough to emit bright light in the visible and near infrared range, with good stability (estimated device lifetimes of at least 4 years), and fast cooling. 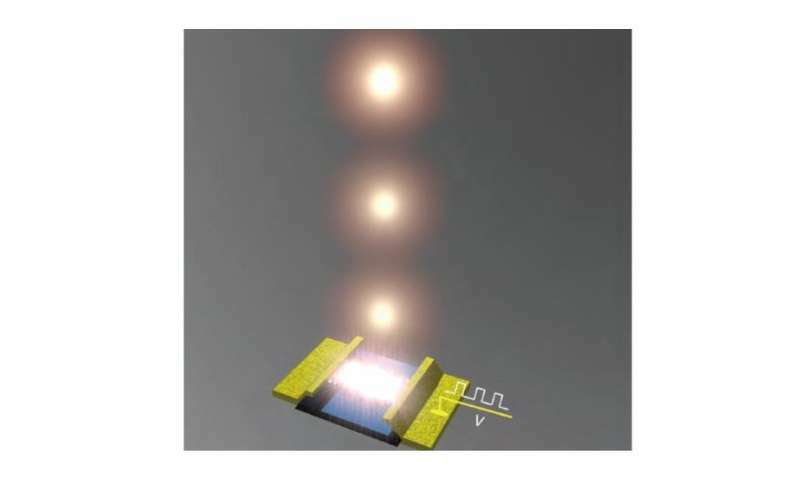 As a result, the device generates ultrafast light pulses with a duration as short as 90 picoseconds and a modulation rate that is several orders of magnitude faster than conventional thermal emitters. The physicists explain that the high speed likely occurs because there are two different types of phonons (optical and acoustic), and the electrons in graphene are strongly coupled to the optical phonons but weakly coupled to the acoustic phonons. Other recent work has shown that electrons and optical phonons form hybrid modes at the graphene-hBN interface known as plasmon-phonon polaritons, which provide highly efficient near-field heat transfer. Together, the weak acoustic phonon coupling and direct electronic relaxation into hBN enable cooling at a much faster speed than required to transfer heat out of the system by conduction, which allows for the high modulation speeds. The researchers expect that the ultrafast graphene light emitters have potential applications beyond 100 GHz optical communications, extending to on-chip spectroscopy, photodetectors, and plasmonics. The devices may also be useful as ultrafast heaters for studying phenomena such as chemical reactions and phase transitions. As a next step, the researchers plan to further improve the devices' light-emitting properties. "We plan to push both the speed and efficiency of these devices," Hone said. "Our calculations indicate that the fundamental speed of these devices should exceed 100 GHz. Right now the energy efficiency is low, but there are many techniques that can be used to boost light emission and reduce heat flow in order to improve efficiency." Graphene, the substance looking for a use. Are there any in-production products based on it yet.